I have been teaching since 1980. I studied at the feet of Yogi Bhajan for many years. I'm currently teaching in North Carolina as part of Level 1 teacher trainings, workshops, sadhanas, etc. My specialties include Humanology, postures, and sound and mantra. A local website that has information on my activities is www.sacredlistener.com. HarDarshan has been a student of Kundalini Yoga and Meditation since 1983, and a teacher since 1985. 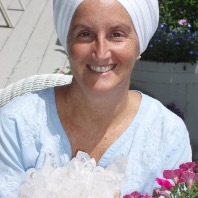 She studied at the feet of Yogi Bhajan for all of those years until his passing. HarDarshan is an ordained Sikh minister, and has done extensive service as a hospital chaplain, focusing on oncology and end of life. At present, she is a Licensed Professional Counselor in the state of North Carolina, and enjoys sharing the technology of Kundalini Yoga with her therapy clients. A Lead Level One trainer, HarDarshan offers yearly trainings at her home/center, Mata Shakti Ashram. Level Two trainings are also held here and HarDarshan enjoys traveling to other centers to offer workshops and teacher trainings.